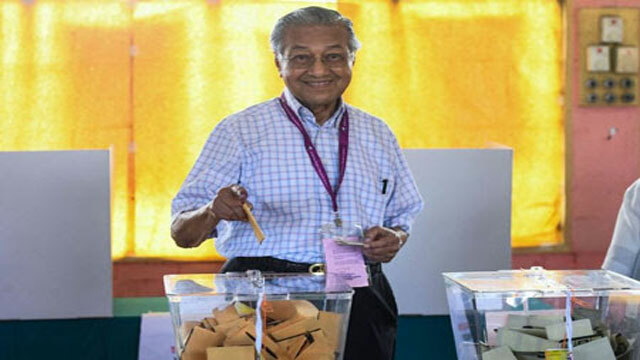 Dhaka, May 9 (Just News): Malaysia’s charismatic former prime minister, who led resurgence of the opposition, has claimed victory in Wednesday’s elections. Pakatan Harapan (PH), the party Mahathir leads after quitting the ruling Barisan Nasional (BN), has “captured the federal government by winning 112 seats”, the Sun Daily reported quoting the veteran leader. He, however, alleged that election commission is not releasing the official results of the election, according to Star Online. "We’ve practically achieved that figure and the opposition has crossed the 112 seats needed to form the government. BN is far behind and there's no way they can catch up," Mahathir was quoted to have said at around 11:30pm local time. In the election, 222 parliamentary seats were up for grabs but hardly any pre-polls survey showed Mahathir ahead of Najib Razak, the prime minister who is leading the BN. Seremban residents flooded the streets to celebrate what they believe is the unofficial victory of Pakatan Harapan (PH) in the state, reported malaymail. It added that the pact’s supporters waved flags as passing cars honked to celebrate what may be a new state government there. Malaymail also reported that PH has retained Penang for the third term by winning 39 out of 40 state seats, effectively wiping out BN presence in the state.